It has been quite a while since the last cooking class… so I am excited to be starting up again! Since I got to spend some time in Bali I thought it would only be appropriate to make some great Balinese cuisine. 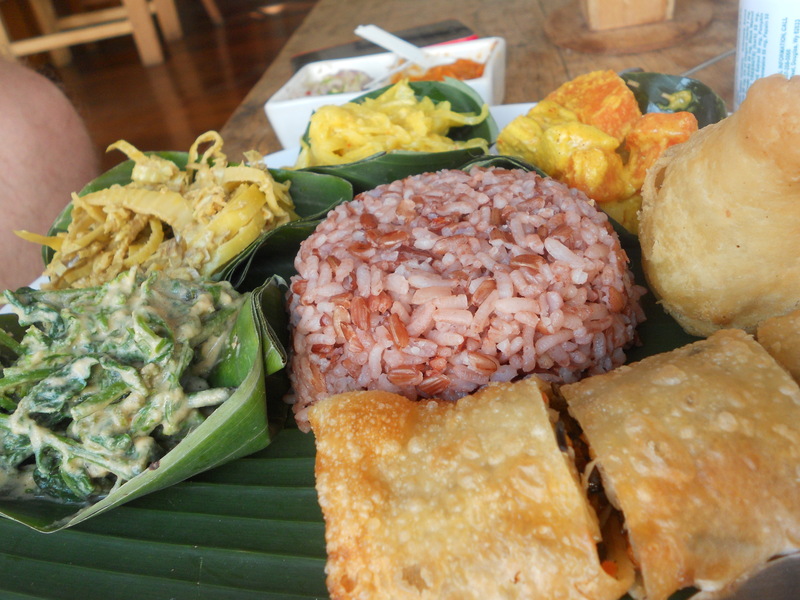 The most popular dish I saw and consumed in Bali was Nasi Campur (mixed rice). Sounds simple enough, but you would not believe the presentation of this dish at some of the local warungs (small cafes). Basically it involves rice with veggies, tempeh, and sambal, a hot mix of chiles and garlic for those who like it spicy! My favorite restaurant in Bali, Warung Sopa was in Ubud, more of the cultural center of Bali… lots of beautiful rice patties and artwork. I especially loved this restaurant because you got to choose which veggie and/or tempeh or tofu dish you would like in your nasi campur. So my cooking class for April is going to be Balinese themed… we will be making Nasi Campur, with seasonal greens and tempeh or seasoned soy curls as sides. Of course there will be sambal to light our digestive fire. For dessert is a pudding made out of chia seeds and freshly made coconut milk with bananas on the top! The dessert is actually inspired by Ani Phyo, from her Ani’s Raw Food Asia book. Chia seeds are even more packed with omega-3’s than flax seeds!!! The cooking classes are on Thursday, April 5th and Tuesday April 17th. Go to my website to see the cooking class schedule for more info. As always the Creative Healthy Cooking Classes are vegan and gluten-free! I can’t wait to try this one!!! It’s going to be super delicious and FUN!! !